Interchangeable with 3M ROLOC (shown on right). Norton "Speed-Lok" and Standard "Quick-Change" compatible version also available. 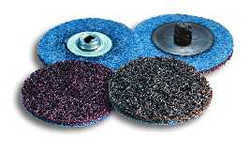 Extra tough with added ceramic grain, coarser and more aggresive than our regular surface conditioning discs.